Car Collection and the Crayola Virtual Design Pro Fashion Collection. If your kids love to color or design cars, or dresses and clothes, the Crayola Virtual Design Pro Collection will be perfect for them. Not only is it fun to use, it is also a good way for them to learn the basics of design. Hobbyists will also find they can spend a lot of time using these design kits. 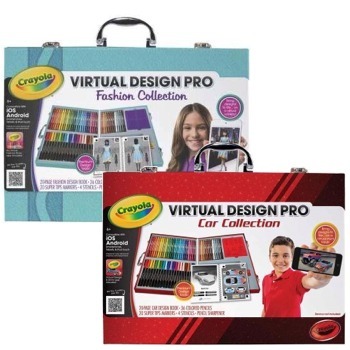 Crayola covered all its bases by making sure to produce Crayola Virtual Design Pro Collection kits for both boys (the Crayola Virtual Design Pro Car Collection) and girls (the Crayola Virtual Design Pro Fashion Collection). Other coloring kits can be quite limiting since they are mainly for boys, or for girls, and that is not going to be a problem with these collections. Of course, the concept of creating a design by hand and bringing it to life on a smartphone or a tablet is quite innovative, considering how almost everything today can be enjoyed virtually. It’s a case of old-school meeting new technology. Using the dozens of markers and colored pencils plus a special sketchbook, the provided templates make designing very easy. Just take a photo of the design using a tablet or smartphone (with the free app already installed) and the design will come to virtual life. But that is not all. Once your design has been processed by the app, the design can still be tweaked and greatly enhanced! It is both compatible with iOS and Android, so compatibility issues will never crop up. For now, there are only the two collections available, but there are rumors of more collections or coloring kits coming out in the future in the Crayola Virtual Design Pro Collection line. This revolutionary product shows a lot of promise and is packed with so many features that, at this time, we cannot see anything to complain about. Both the Crayola Virtual Design Pro Car Collection and Pro Fashion Collection are sold for $39.99. Crayola has not yet made any announcements on warranties and guarantees pertaining to this product. The Crayola Virtual Design Pro Collection costs $40. With its ability to engage attention in the creative process, all the way to converting the end result into something virtual on a tablet or smartphone, it seems well worth the price. The Crayola Virtual Design Pro Collection is going to be available almost everywhere, but expect to find them first in many online merchant sites, with Amazon being on top of the list. Let your little designers-in-the-making discover the joy of creating and designing, and having the satisfaction of seeing their masterpieces brought to life, just by using the Crayola Virtual Design Pro Collection!